So I was disappointed both by Scratches and Barrow Hill, both “slideshow”-style adventure games made by small developers and geared towards the horror genre, both recipients of lavish praise from the adventure game community, both utterly undeserving of said praise. 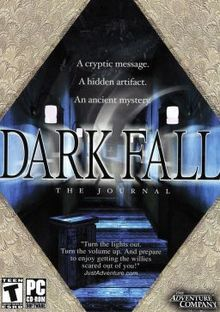 To be honest, by this point, I was pretty discouraged, but I thought I would give the very similar Dark Fall a try – mainly because it was a major inspiration for the other two. 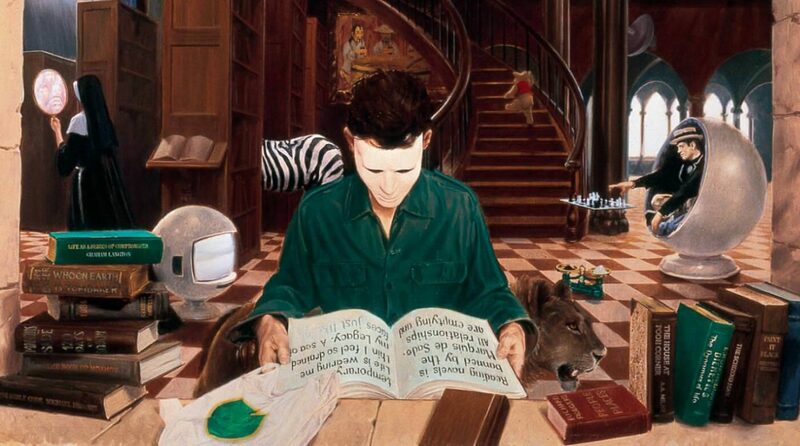 Published by The Adventure Company in 2002, it seems to have kicked off a fad for taking the Myst model of adventure games and making it all creepy – in fact, the folks behind Dark Fall helped the Barrow Hill project reach its fruition. Maybe that’s it, I thought to myself. Maybe Dark Fall was so amazing it blew everyone’s socks off, and after that every time people saw a game which even reminded them of Dark Fall they got all giddy about it. Perhaps this is the real deal and Scratches and Barrow Hill were just pale imitations, inherently inferior to the original. I was wrong. Dark Fall is just as bad as the others. But at least it’s bad in different ways. First impressions first. The graphical quality of Dark Fall is a clear step below Scratches and Barrow Hill, but that isn’t actually a problem – in fact, it helps evade a good many of the problems the other two games had. With simpler, less detailed graphics, pixel-hunting is cut down dramatically – no more hunting through the clutter for a tiny object hidden amongst a heap of similar tiny objects, all of which look similarly significant. Unfortunately, the actual interface brings back sufficient pixel-hunting issues to make up for the ones the simpler graphics eliminate. Interactable spaces of the screen will sometimes crop up in startlingly small spaces, or hovering a good inch to the left of the object which they actually seem to correspond to. What’s worse is the way that this doesn’t actually become apparent at first; early on, in the game you’ll play along and think to yourself “Oh hey, a slideshow-style adventure game where I don’t have to methodically scan every single screen with my mouse cursor in order to find tiny hidden interactable bits”, but no, that’s just a trap, eventually you’ll get so stuck not even the haunted hint system can’t help you and you’ll have to look up a walkthrough, and then you’ll realise that dear Christ, the people who make these games just can’t let go of this lousy flaw in their gameplay model. But then, if they backed away from the tiny and sloppily-placed interactable spots, they might have to work on making the puzzles entertaining and challenging. Although, as in Scratches, the designers have gone to great effort to make sure there’s a certain redundancy of information, which helps greatly in establishing precisely what’s going on, often there will be great swathes of information which you just plain don’t need to read – and it’s not always obvious whether a puzzle will lead to something which actually advances the plot or just more background blurb. Fair enough early on, but once you’ve worked out the scenario and want to take decisive action to resolve the curse it gets irritating. About that haunted hint system. When you start the game you encounter the ghost of some kid who disappeared from the haunted station/hotel the game is set in, and he tells you that he can give you hints throughout the game; simply go to the place where you’re stuck, “concentrate” (which I took to mean stare at the puzzle for a while) and then return directly to where the kid habitually spooks about and you might be granted a little vision that points you in the right direction. In theory this is a nice idea. In practice it means that when you do get stuck you spend an awful lot of time running back and forth to the hint-giver’s naughty step in the hopes that you’ll get a clue dangled in front of you – and since the kid only helps with some of the puzzles and there’s no way of telling which, often that trip across the game map will be completely wasted. But aside from the presentation of the puzzles being just a little off, the plotting and atmospherics – both absolutely vital to making a horror game function – just don’t work. The plot is simplistic and can be mostly pieced together within your first half hour or so of play, and there’s a sloppiness to the presentation that’s just plain unforgivable. For starters, throughout the game the name “Arthur” is misspelled “Arther” consistently. Arther isn’t a name. You wouldn’t find middle-class English painters from the 1940s called Arther. Arthur is spelled with a u. A uuuuuuuuuuuuu. Secondly, when you arrive in the haunted train station/hotel that your brother has been renovating and find his PDA, it details about how he and two local ghost hunters arrived at the site in April of 2002. When you get into the ghost hunters’ room and read their records they talk about how they came to the station and met up with your brother in April of 2003. When you can’t even get very basic points of internal consistency correct there’s no hope of engaging anyone with your plot. Nor did the game really manage to scare me. In fact, at no point did I feel that my character’s life was in any danger – real or imagined – from the dark forces gathering underneath the station. This is a serious problem when half the handouts you encounter say “oooh, the spooks are so evil, they’ll kill you ya know, kill you stone dead”, but in practice it’s nigh impossible to actually get yourself killed. The game tries to make up for this with atmospheric noises and voices and mutterings you hear as you progress around the map, but the problem is that it only has a limited palette of these, and the same ones pop up in the same locations over and over again. Since typically in a game of this type you’ll wander around the map a lot as you browse the puzzles pondering what to do next, you’ll have plenty of opportunities to become very, very familiar with all of the hauntings, and familiarity breeds not-scariness. At the end of the day, Dark Fall is a very, very simple game. (So simple, in fact, it stores its save files as two lines of plain text.) Because it is so simple, it has been easy for the makers of Scratches and Barrow Hill to produce their own take on it. But because it is so simple, it never quite manages to establish the atmosphere it needs to in order to succeed as a horror game. It’s not that you can see the strings – never has been a video game where you couldn’t – so much as those strings just don’t have enough interesting stuff attached to them to really fill out the picture. And of course adventure gamers love it because you could poop in a box and call it an adventure game and those guys could find a way to praise it to high heaven.